This may screw me on the east side but if you want to alleviate flooding in Houston, de-bottleneck the downtown bayou. There is a huge bottleneck right before the bayou widens on the east side where water comes out of the bayous instead of flowing through buffalo bayou. Looking at the water flow on the east side, you can tell based on the flow rate that there is very little in the way of restricting the flow out to the ocean. That water is disgusting. I’d be hard pressed to ever call it an “amenity”. Nice idea, but the environmental impact study would take 30 years and cost a billion dollars. Then the answer would be ‘No’. There are already a ton of canals. Go to https://www.harriscountyfws.org/ and turn on the “Channels” layer. Some names you’ll recognize (Spring Branch, Hunter’s Creek); some names are charming (Buttermilk Creek, Brickhouse Gully); others less so (Poor Farm Ditch); while many just have alpha-numeric designations or bland descriptors (“W157-00-00, Unnamed tributary to Buffalo Bayou”). Some are buried, but most are open channels. What very few of them are is picturesque. That’s because you can’t build anything next to them. What makes the canals in Amsterdam (or Venice, or Bruges) pleasant isn’t the canals themselves, it’s the architecture that surrounds them: buildings placed directly on narrow, mostly pedestrian right-of-way. Channels used for storm drainage will never be able to have the same kind of architecture as canals used primarily for navigation. New Orleans and its suburbs are criss-crossed with canals, almost all of them are super ugly. The need to keep the water channel clear of debris and accessible by heavy equipment makes attractive landscaping and amenities hard to accomplish. our bayou water that we do have in braes and buffalo bayou that flows at normal levels is a majority gray water. @ Angostura: San Antonio’s Riverwalk was originally envisaged as a flood control project, and also as sort of a knee-jerk reaction to a very bad flood. It didn’t take very long thereafter for them to realize its potential for urban development and tourism. I wouldn’t say that doing something similar in Houston is impossible by any means, but it would take a lot of vision and money. Sites that could be developed in concert with that in mind include The Reisner Courthouse/HPD site, the Post Office site, Hardy Yards, the UH-D parking lots, the METRO bus barn, and a lot of individual parcels just east of there (provided cooperation with TXDoT and the aggressive use of eminent domain). The Buffalo Bayou Partnership had already identified this as a need and proposed a canal through the northeast part of downtown, but that seems more and more like a pipe dream — and it was already kinda that. Well…in any case, if something is to be done then it ought to be done really quick. if they built canals everywhere this would resolve the mass transit issue as well… gondolas as far as the eye can see!!! You couldn’t launch this plan without straight up eliminating new development outside 610 as replacing streets with canals requires significant density to not hinder economic growth. Won’t ever happen. New Orleans is more similar to Amsterdam and they’ve done absolutely zero with this idea, despite studying it for decades. Most of our right-of-ways are way wider than they need to be. A typical residential street with open ditch drainage might have a 60 or 70-ft right-of-way, plus 25-ft setbacks on either side, making it well over 100 ft from façade to façade. How about we sell the middle 40-50-ft of the right-of-way for zero-setback construction, dig out the ditches to be more like canals (or put in culverts and cover them), and convert a 15-ft swath of the front yards/setbacks into either pedestrian space or woonerf-style streets (w/ one way traffic). Front yards are stupid wastes of space, anyway, and most of these streets only see about 50 cars per hour. Also, it would eliminate complaints about non-residents parking on the street, since there wouldn’t be any (parking, that is). 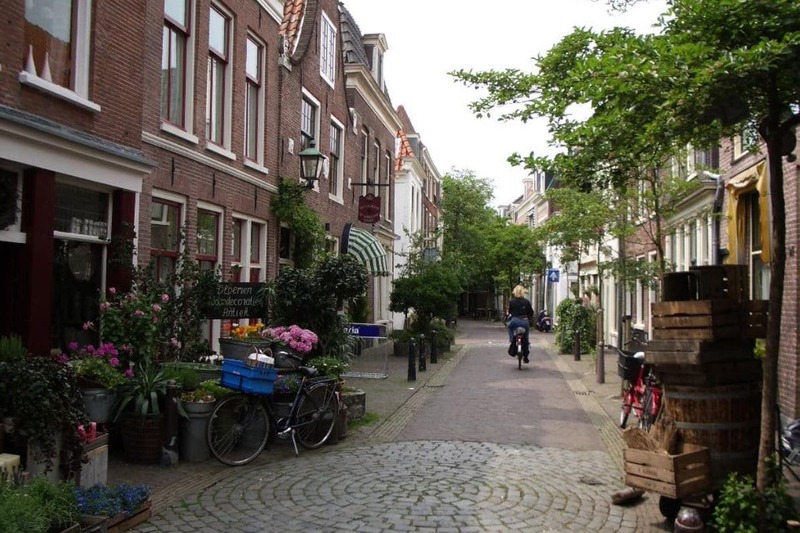 I mean, would it be so terrible to live on a street like this: http://www.canin.com/media/2014.06.05-Woonerf.jpg ? @ Angostura: Eh, there’s nothing wrong with bigger culverts under wide streets, and in some places yeah I think that it’d be feasible to narrow them or make a landscaped median, but I was mostly thinking in terms of master-planned new construction situated around canals, with all this on large low-lying brownfield sites. I mean, take your photo and replace the row houses with ranch-style single family homes with side yards, like in Meyerland…and, no, that wouldn’t really resemble your picture.